Harrity, who had defeated Canadian Thomas King in the previous qualifying round, picked up where he left the preceding day by rapidly imposing his rhythm in the match. He was able to establish court dominance over his second Canadian opponent, who was searching for answers. This resulted in a quick game that ended in the American’s favor 11-2. McCue varied his shots in the beginning of the second game but Harrity always seemed to have an answer to McCue’s attacks. The top qualifying seed seemed to be able to predict where the Canadian wanted to send the ball, and was able to run off with the second game 11-3. Harrity took advantage of every opportunity offered by McCue to finish off rallies in the third game. The Canadian wasn’t able to keep up with the pressure, and the first seed was comfortably able to take it 11-5. The second match of the night sees New York native Christopher Gordon take on the British Virgin Islands representative Joe Chapman. The American cruised to a big opening lead as Chapman couldn’t settle himself in the game, with Gordon able to capitalize on the sixth seed’s numerous mistakes. A late resurgence from Chapman proved to be too little, too late as he served out on game point and Gordon took the game 11-5. The second game was more evenly contested, as both players brought up the intensity early on, leading to numerous interference calls. Chapman seemed more composed and was able to drag the rallies long enough to force his opponent into committing mistakes. However, the British Virgin Islands representative strung a series of unforced errors in the last portion of the game, allowing the American to take it 11-8. The third game started in sloppy fashion as both players seemed out of rhythm. Gordon was able to get on his game first as he forced his opponent into committing more mistakes. Like his preceding match against local Jason Delierre, Gordon finished his rallies in remarkable fashion, much to the disarray of Chapman. Gordon ended up taking the game 11-7. The match started evenly disputed, and the Jamaican was the first to take initiative by taking advantage of a few fortuitous bounces. Haycocks was able to regain composure and storm back as both players were keen on establishing their presence on the court. The Englishmen took advantage of a few errors from the Jamaican to take the first 11-7. The second game started off with Haycocks applying heavy pressure on Binnie, who did well to limit the damage by extending the rallies. The Englishmen was initially rewarded for his initiative, grabbing an early advantage in the game. Binnie did well to counter Haycocks’ pressure and come back into the game, and managed to counter his opponent decisively, taking the second game 11-9. Haycocks lost his composure as he piled on mistakes, allowing the Jamaican to take an important lead by rapidly grabbing the third game 11-2. Haycocks temporarily calmed down at the beginning of the game, slowing the rallies. Haycocks again seemed to lose the edge in the later portion of the game as Binnie came back and upset the winner of the previous PSA event held in Montreal, 11-9 in the fourth. The last match of the night sees local favourite Shawn Delierre, Canada’s top ranked player, squaring off with Joel Makin from Wales. The match started off with long rallies and the players showcasing their retrieving capabilities, much to the delight of the crowd. The local favorite, known for his grueling style, was able to move Makin around court and create enough opportunities to capture the first game 11-8 in a long, hard-fought 24 minutes. Makin came out strong in the second, seizing an early advantage through well-worked rallies. Delierre’s experience allowed him to come back in the game, by successfully managing to counter the youngster’s attacks. The Welshman managed to resist the local favorite's surge, and took the second 11-9. The Canadian came into the third aggressively, which took his opponent off guard. Delierre’s tactics frustrated the Welshman’s who started to accumulate errors as the game dragged on. The fan favorite was able to keep his lead and take it 11-7. The fourth game started in the same vein, with both players still often tangling into each other. Delierre was the calmer and less affected player as he cruised to a big 7-2 lead. The match was interrupted for a while due to a blood injury (small cut on a knee) to Makin as he was attempting a comeback. Ultimately, Shawn was able to stave off the Welshman’s momentum and qualified for the main draw by taking the fourth 11-8 and the match 3-1. The crowd was ecstatic with their favorite's performance, in a grueling match that lasted 102 minutes and featured 65 calls. The last $35k Montreal Open was held in Oct 2014, with a $5k invitational event held in Dec 2015. 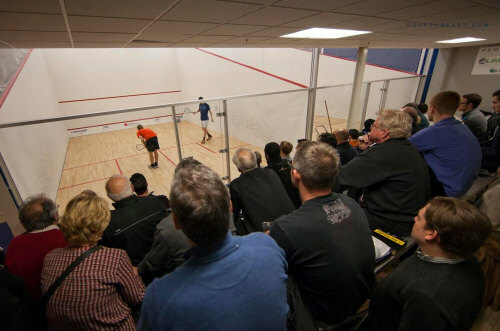 The Montreal Squash Open 2016’s qualifications started up on Tuesday with Michael McCue, the 8th seed of the qualifying round clashing against a local favorite, Sebastien Boucley. The match started with McCue dictating the play, essentially moving Sebastien around with a wide array of shots. Boucley was able to hang in the rallies, but was doing most of the work with the eight seed establishing his dominance at the middle of the court. The first game ended 11-7 for McCue, with a visibly exhausted Sebastien stepping off the court. The second game was a little bit more of the same, with the Ontario representative still dictating most of the rallies and moving Sebastien around. Ultimately, Seb's energy level visibly began to drop, and the unforced errors started to pile up which offered a healthy lead for McCue. The second game finished quickly with a score of 11-2. The third game was similar, with McCue, who was a finalist at the last MAA Invitational in December, able to take a comfortable early lead. Sebastien was not able to find an answer to McCue’s dominance, who quickly grabbed the third game 11-3. Two old rivals were clashing off on court 1! The match started off a little slow, with both players taking a while to settle into the match. Phillips showed some impressive offensive display and was able to surprise Shawn, known for being an extremely fast and resilient player, with some well-placed drops. The first game required a tiebreaker to separate the two players, with Delierre surviving two game balls before being able to take it 15-13. The second started in a similar fashion: David was pressing Shawn with some well-placed drop shots, while Shawn was using his stamina to stay in the rallies and wait for an opening. His impressive retrieving skills were really the deciding factor, as he was also able to catch Phillips off guard with a couple of drop shots from the back. Canada’s top ranked player was able to come back from an early deficit to capture the second game 11-9. In the third game, Shawn was able to utilize some great placement shots to grab an early lead at 5-1. Phillips however was still willing to fight for this match, and capitalized on a couple of unforced errors from Shawn to close down his lead and come back to 5 all, sending Shawn the wrong way on multiple occasions with some deceptive shots. However, nearing the end of the game, Shawn’s fitness proved to be the difference as he was able to close off the court well after Phillips tried to apply pressure, and Shawn was able tot ake the third game 11-8. 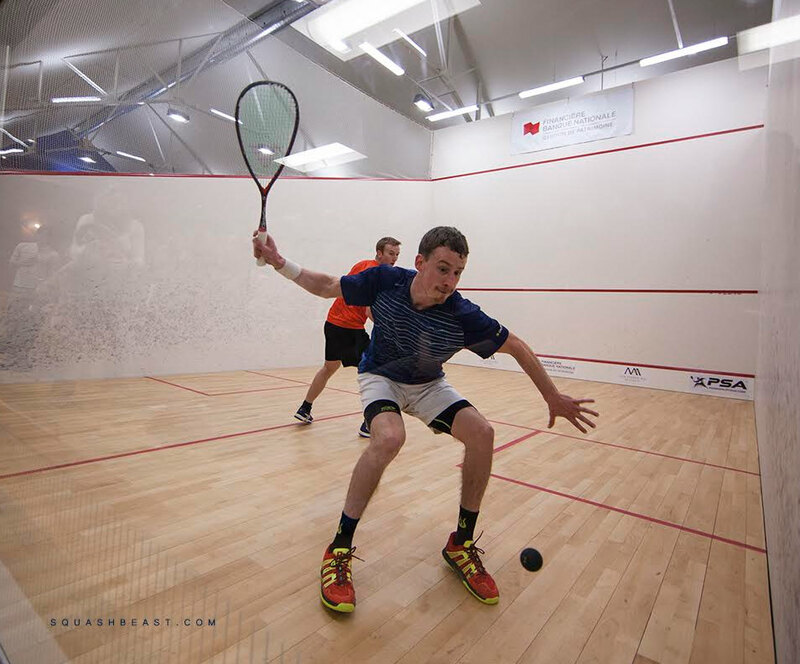 Our following match on court one had Montreal's top junior player Tommy Scott (aged 17) playing against the sixth seed, Joe Chapman from the Virgin British Islands. Early on in the match, Chapman proved to be the more consistent player. Even though Scott was able to aggressively grab a few rallies with some inch-perfect drop shots, the majority of the points were dictated by the sixth seed. He was able to keep Scott from attacking by keeping him at the back, and establishing positional advantage on the court. The 99th world ranked player was able to string a series of points, cruising to a 11-6 advantage in the first game. In the second game, Scott looked a little nervous on court and strung a couple of unforced errors, allowing Chapman to build a big lead. After a comical trade-off of missed serves, the sixth seed consistency allowed him to make a statement by taking the second game 11-3. Scott entered the third game strongly, able to establish a couple of well executed offensive shots and grab an early lead. However, this advantage was short-lived as a series of unforced errors ultimately cost the youngster his lead, and ultimately the match as the third game reflected the experience gap between the two players. Chapman ended up taking the game 11-6, and the match 3-0. The next match on court 2 was played between Jason Delierre from Montreal and Christopher Gordon from New York, ranked 57th in the world. The match started off with some long rallies which allowed the players to showcase their impressive retrieving capabilities as well as their nifty footwork. Both players were able to move the ball around the court. However the American’s finishing touch on a lot of these rallies proved to be too much for the local Montrealer. Gordon managed to pick up the first game 11-6. The second game played out in a similar fashion, with Gordon capitalizing on most of the opportunities to end the rally. This allowed him to take an early advantage in the score, and was able to protect his lead and take the second game 11-6 as well. The third game saw both players still willing to leave it all out on court. Delierre, eager to impress his home crowd, was able to take an early lead with some well constructed rallies. However, winning those points began to take its toll, and the 57th world ranked American was able to recover and come back in this game. The players were even at 5, until Gordon was able to show his fitness advantage, 11-5 in the third game, taking the match 3-0. Jaymie Haycocks was back on the courts where he won a 5k event this past December. He started out on the offensive and was rewarded with an early lead in the first game. It was his defensive capabilities that were then showcased, staving off a lot of the pressure Hapers tried to bring into the game. The Englishmen was able to comfortably take the first game 11-5. The second played out similarly, with Haycocks absorbing the Belgian’s pressure well and showing excellent counter-attacking skills. Hapers did mount a comeback, but ultimately went down 11-8 . The Belgian started off the third game strongly, and roared to a 8-3 lead. However, Haycocks finally found his composure and was able to come back to 8-8. Ultimately, Hapers managed to take the game, in a fortunate frame shot, 11-9. Haycocks started the fourth game strongly and made amends for the third game by grabbing an early commanding lead. Hapers was never really in it in the 4th and Haycocks took the game 11-5 and the match 3-1. Binnie started the match by putting the American under tremendous pressure. As a matter of fact, the only saving grace for the American was an unforced error at 10-0. Binnie took the first game 11-3. The second game was a lot closer, with Gould showing more presence in the rallies. However, the Jamaican upped his game on the crucial points at 7-5, and ran off deservedly with the second game 11-7. The third game again showed Binnie’s dominance, as he had answers to everything Gould did. Ultimately, the fifth seed took the third game 11-5 and the match 3-0. The 8:30 match on court 2 opposed Thomas King from Regina and the first seed, Todd Harrity from USA. The American rapidly imposed his rhythm, and was able to keep the Canadian away from the middle of the court. This allowed him to seize an early commanding lead, and ultimately taking the first game 11-3. The second game was more of the same, with Harrity again controlling play, with the Canadian only able to look for ways to survive. Harrity rapidly took the second game 11-2. The third game saw Harrity again take an early lead, but King finally found a way back in the game and brought back the score to 6-7. This would prove to be the Canadian’s last ditch effort in the match, as Harrity regained composure and managed to finish off the match with a score of 11-9 in the third. The last match of the night opposed Joel Makin, the seventh seed and Lewis Walters from Jamaica. The first game was played at a frantic pace, and there was not much separating the two players. The rallies were long and grueling, with both players moving well on the court. Ultimately, towards the later stages of the game, Makin was able to capitalize on opportunities given by the Jamaican and was able to take the first game 11-8. The second game was lopsided in the Welshmen’s favor, with Walters seemingly tired from the first game. The seventh seed was able to take control of the rallies taking the second game 11-2. The third started off evenly between both players but at 3-all, a couple of errors from the Jamaican put Makin in a commanding position. He was able to close off his opponent, and establish control of the court on his way to an 11-5 win.